Though they may look beautiful, icicles hanging from the roof and gutters of your home and garage can spell serious trouble. Despite making your home look like it is straight out of a Christmas card, the picturesque icicles that hang from your roof each winter can cause major injuries or worse if they fall on somebody, and are also likely indicative of a larger problem: an ice dam. With snow starting to fall across the country, there are a few things homeowners should know about icicles and ice dams, including how to remove them and prevent them in the future. Icicles form as water drips down from your roof, hits your rain gutters or the edge of your roof, and freezes again in a downward formation. Small icicles do not pose much of a threat, but large icicles left to grow over time can be dangerous to you, your family, and your pets. If left hanging, large icicles can become unstable and will likely eventually fall. These sharp and very heavy objects can cause serious harm to any person or animal standing underneath them when they fall. Use a Snow Rake – Snow rakes are specifically designed with wintertime conditions in mind. People use them to remove excess snow from their roof and knock down any icicles that have formed. Simply use the rake to knock off any icicles, while standing safely away from where the icicle will fall. If snow has built up on your roof, do your best to use the rake to remove as much of it as you can safely. This will help ease the pressure on your roof and prevent other problems. Use a Fan – For particularly troublesome areas, where icicles tend to form often, try using a fan. Simply aim a fan at the intersection of your roof and your rain gutters. If you do not have rain gutters, aim the fan at the point where the icicles are forming. Once the fan is on, existing icicles will likely melt, and the airflow will prevent icicles from forming in the future. Try Heat Tape - Heat tape is one of your best options for preventing icicles and ice build up. Within the tape is copper wiring, through which electricity is channeled, thus preventing any ice buildup from occurring. Ideally, homeowners should install heat tape before a big snow storm or cold temperatures hit, but heat tape can also be installed once ice has formed, just with a bit more difficulty. Consider placing the tape inside your gutters, at the edge of your roof, or anywhere else that ice seems to build up, and simply turn the tape on when winter weather hits. While icicles are dangerous if they fall on somebody, they likely will not do much else to damage your roof. They can, however, indicate a much more serious problem; an ice dam. When snow and ice melts from your roof, due to warmer temperatures coming from inside your home or garage, it can easily build up in your rain gutters or get stuck behind existing icicles at the edge of your roof, forming what is known as an ice dam. Once an ice dam is formed, any water that melts from your roof is trapped behind the dam, leading to build up beneath shingles or water damage within your roof. If left unchecked, ice dams can cause serious damage. Eventually, the built up ice and water can seep through your roof, harming your ceilings, sheetrock, and even paint. In addition to interior damage, ice dams can pull off chunks of shingles with them while being removed, and, like icicles, can cause harm to anyone standing underneath them if they fall. Fortunately, there are many tactics you can employ to remove and prevent ice dams. Break up the Dam - Removing an ice dam can be dangerous work. 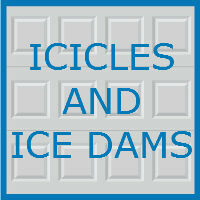 One option is to remove the ice dam yourself, or with the help of a professional, by breaking the dam apart. Use a blunt mallet to chip away at the dam, making sure the area beneath the dam is clear at all times. With winter roofs often icy and slippery, removing large dams by yourself can be dangerous, so calling a professional roofer may be necessary. Avoid using sharper tools like axes to remove the dam, as these tools can cause damage to your roof in the process. Make a Melt Through - If removing the dam completely is too big of a burden, consider creating a passageway for water to pass through the dam and drain off your roof. To do so, grab a nylon stocking and fill it with calcium chloride ice melt. Position the stocking on the dam in a place that will create a tunnel of sorts for the water to pass through. While other ice melting products can work as well, be sure to check and make sure whatever deicing product you use will not damage your roof, or any plants beneath it. Clear Your Gutters and Roof Often - People frequently allow ice and snow to build on on their roof unchecked for too long, causing ice dams and other problems to occur. The best wintertime preventative measure to keep your roof safe is simply to remove ice and snow each time a storm hits. Use a snow rake to remove as much snow and ice as you can from the edge of your roof, and be sure to keep your rain gutters clear as well. This will keep all pathways clear for water to drain off your roof smoothly. Install Proper Insulation in Your Home and Garage - If insulation is installed in the roof space of your garage and home, the change of temperatures that causes ice to melt and become a problem will not occur as easily. Look for places where warm air could be rising from your home or garage up to your roof, and be sure to insulate those areas well. For other helpful wintertime tips for homeowners and garage enthusiasts, be sure to check out our Sky Writers Garage Blog. The staff at Blue Sky Builders is equipped to assist you with your next garage improvement project. 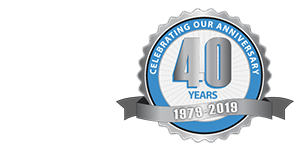 Visit Blue Sky Builders online, or call 630-852-8485 to find out how we can help today.